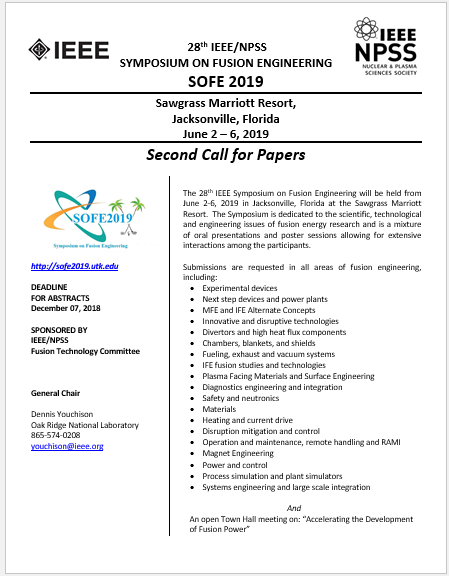 Please find attached the 2nd call for papers for the 28th Symposium on Fusion Engineering which will be held June 2-6, 2019 at the Sawgrass Marriott Resort near Jacksonville, FL at Ponte Vedra Beach. Visit the website at http://sofe2019.utk.edu to submit abstracts and access the conference registration link. The deadline for early consideration of abstracts is December 07, 2018. All international participants requiring a visa should submit by this date. Also note, deadline for early registration is April 15, 2019. Take advantage of the reduced rates and register early. 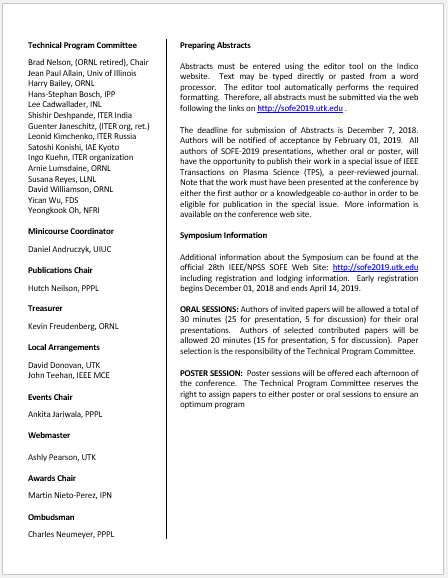 SOFE2019 is an exceptional value, and IEEE members receive deep discounts. If you are not a member, please use this opportunity to join and receive a discount on your first year of membership in addition to the reduced conference rate available to members.